The Game of Thrones season 8 poster is absolutely horrifying. Warning – This post contains potential spoilers for Game of Thrones season eight. 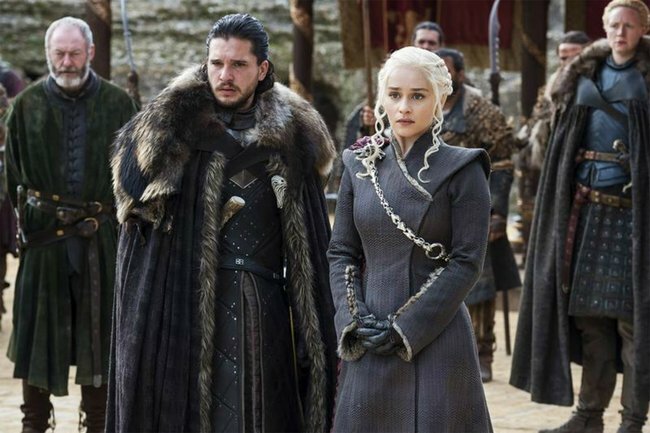 The eighth and final season of Game of Thrones is just around the corner and at this point, we’re not sure if we should be excited or just really nervous. Now, ahead of the fantasy drama’s April 15 premiere, HBO has shared a brand new poster for the series. And oh boy, it’s utterly horrifying. In the poster, all of the show’s star characters – including Jon Snow, Daenerys Targaryen, Arya Stark, the Night King, Cersei Lannister and Jamie Lannister – are shown lying unconscious, or dead, in the snow in the shape of the Iron Throne. As expected, fans of the series have began analysing every single aspect of the new poster in search of possible clues. But there’s one fan theory about the poster that is seriously freaking us out. Of course, one popular theory is that absolutely every character in the poster ends up dead – and honestly, it’s a theory we don’t even want to think about. The most compelling theory, however, is that everyone on the right side of the image ends up dead during the final season, while everyone on the left side survives. “What if the left side of the picture lives and the right side dies? I can’t imagine they would do this in an image, but A LOT of them match people’s estimations of who would die,” Reddit user JimmyNice speculated. “The ones outside of this theory for me are Sansa on the right and Melisandre and Jaime on the left,” he added. If this theory is correct, it could mean characters including Bran Stark, Daenerys Targaryen, Sansa Stark, Theon Greyjoy, Cersei Lannister, Varys and the Night King won’t survive the Great War. Although it’s fairly plausible that Cersei and Varys will die this season, the likelihood of Sansa and Daenerys dying is a little more far-fetched. Amid the release of the new poster, a new teaser trailer was also released. Although no characters are seen in the footage, the camera pans over Winterfell showing objects buried in the snow including Arya’s sword, Jon’s sword and Bran’s wheelchair. Here’s how dramatically the Game of Thrones characters have changed since the first episode. There’s a feature-length Game of Thrones documentary coming to fuel our addiction. The 5 most convincing fan theories about season eight of Game of Thrones.